On the 1st of December each year I wake up all excited about being allowed to start Christmas decorating. 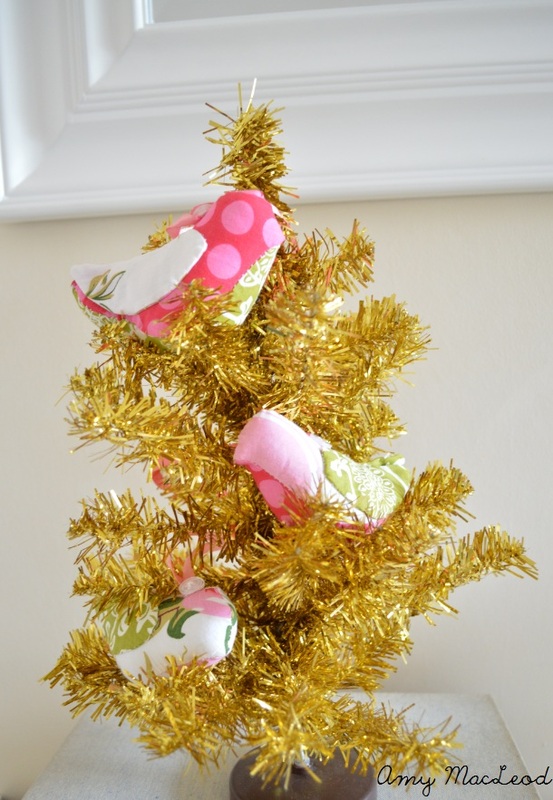 With it being the start of Summer here, I was really determined to have a white Christmas tree and use gold as an accent - to keep it really, really simple, light and summery. But as fate would have it, we were gifted a green tree with red decorations a few days earlier and I wasn't going to turn those down. Enter our double-sided Christmas: Pink & Gold on one side of the room, Red & Green on the other. Our living room is normally all white and bright with some yellow accents (see it here) so it's a little odd for me to see a dark tree and wintery-looking colours here. To counteract it I tried to use the lightest decorations I could find - I love those big white poinsettias in the tree, and they work in a vase too. I would love to have more (a set of 5 would be perfect) but they were way too expensive to splurge. The stockings I sewed myself on a whim (call me crazy but I was desperate for a stretchy, floppy, gold-metallic striped stocking that I could make in about half a minute) and the jars and green bag on the mantle hold spare tree decorations, mainly because I don't know where else to put them. 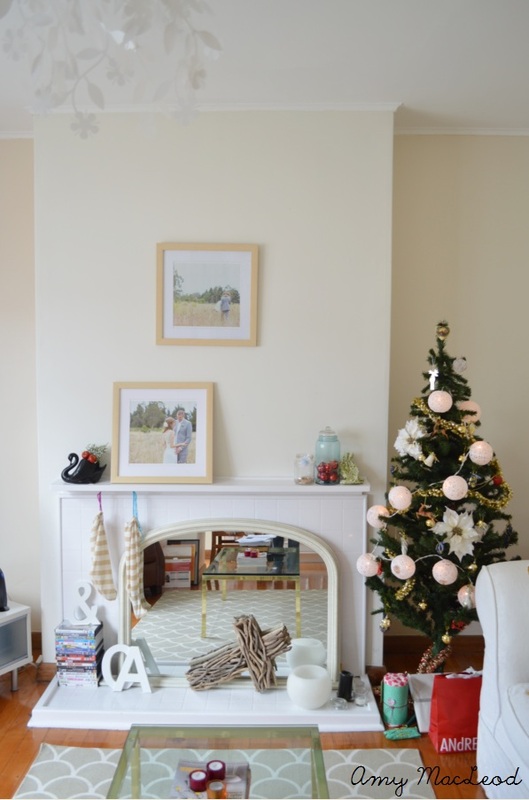 I feel like there is a lot of hype around Christmas 'styling' (especially in the blog world) and to be honest I have decided it's easier just to let ours evolve and not stress over vignettes, etc. Really, I just want to concentrate on Summer and trying to get my legs a faint shade of brown again! 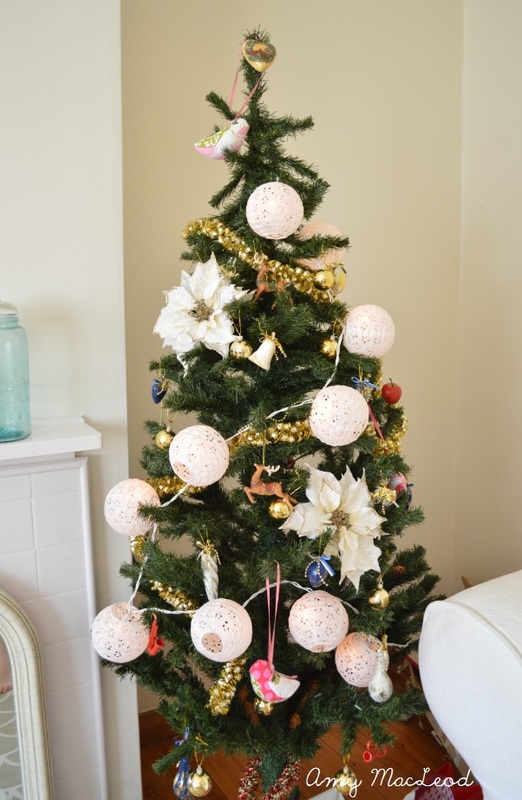 How do you decorate at this time of year? 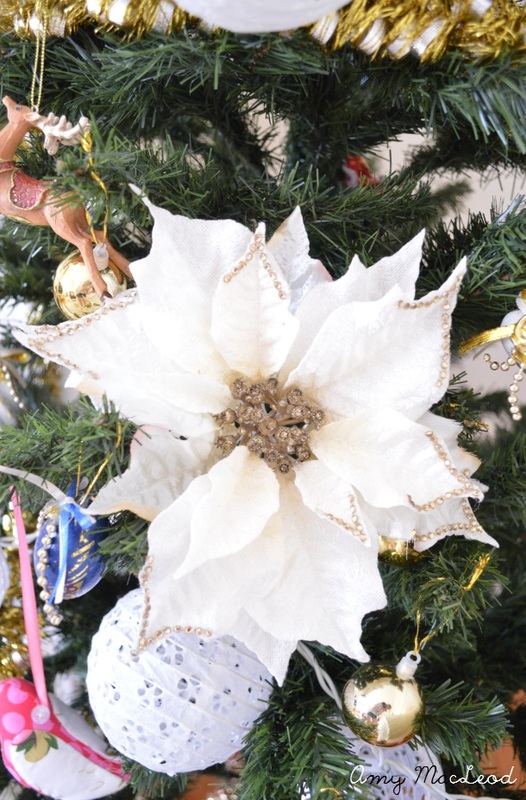 Do you buy tree decorations, or collect them over time? I'm curious to hear! I can not even imagine Christmas during summer! How cool, I must admit my Christmas in Southern California is probably not too different some years. LOVE all your decorations, I'm with you, I always go light and bright. Who says Red and Green are required?! So festive!! I'm loving it all! this is so cute! i love the trees. it's so strange to me that it's summertime and Christmas time together though! I love the string of lights on the tree they are really cute ! the holidays are definitely around the corner! I love seeing how you decorate for Christmas since doing so in the summer is so foreign to me! It looks fantastic and I'm starting to wish we celebrated Christmas in the U.S. during the summer as well! It's such a light and cheerful color palette, with a wonderful airiness to it - it's just so pretty! 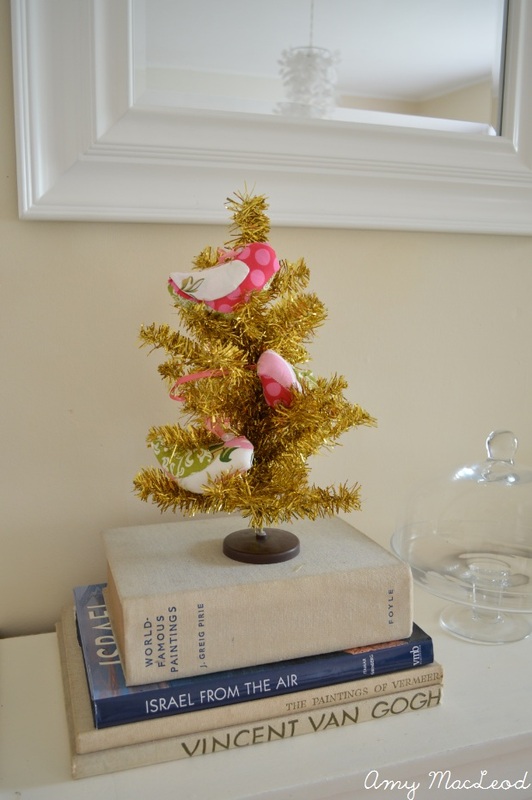 I really love the little gold tree with the pink birds too - you have such great taste in color. Great post and great photos! !